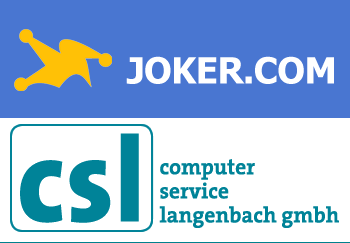 With Joker.com, CSL Computer Service Langenbach GmbH became one of the most successful domain registrars in Germany. Offering best conditions with optimal handling for our customers, resellers and registrants always is and has been our first priority for acting. After many years of cooperation with our swiss business partner EIS European Internet Service AG in Zug, the surroundings of the domain business and legal conditions have changed. These changes have induced the board of directors of the EIS AG, to liquidate their business and offer it on behalf of the customers to CSL GmbH as a full takeover. CSL GmbH agreed to this offer, and will therefore continue to offer domains using the CSL trademark “Joker.com”, and will also continue all existing customer relationships without change. We will also inform our customers separately in the near future. We as CSL GmbH are thrilled to run Joker.com, continuing the success and helping to further form the domain market. We are delighted by the trust that you – our clients – place in us, and we look forward to continuing our collaboration with you. Our pipeline is already full of innovative new features – please stay tuned!